Rachael, Rachael, Rachael. I’ll agree that Ms. Ray is a nagging personality to listen to for even a 30-minute meal. If she says E-V-O-O one more time I just might reach through the TV and slap her silly. 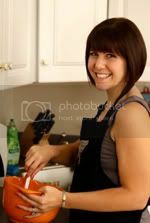 But, the gal sure can cook. I find myself doctoring up a lot of her recipes. I thought her Meatloaf Muffin idea was genius. I’m a self-proclaimed Sliver Queen. “Oh, don’t mind me; I’m just having another little SLIVER.” Well that sliver turns into five more slivers and before I know it, I’ve eaten an entire second portion. Then, I plop down on the couch grumpy and defeated. Meatloaf, you won’t get me this time! This recipe is a perfect way to control portion size. Just have two mini loaves with a veggie on the side and you’ve got yourself a comfort food feast that won’t leave you feeling plump. I’m calling my spin on Rachael’s creation Mini Turkey Meatloaves with Barbecue Sauce. I’m using ground turkey instead of ground beef. This cuts some of the fat and believe it or not, I actually prefer the turkey. It has a much softer texture. Just be careful to avoid ground turkey breast. Ground white meat has the texture of rubbery marbles. Yick! Having some dark meat in the mix really does help to keep the loaves nice and juicy. I also cut the amount of BBQ sauce in half. BBQ is jam packed with sugar, but it’s also full of flavor. Half the amount delivers the same taste without the unnecessary sugar spike. I know you’re tempted to serve meatloaf with a side of creamy mashed potatoes. Who wouldn’t be? Mashed potatoes are actually one of my top 3 favorite foods in the universe. The universe! That’s huge. 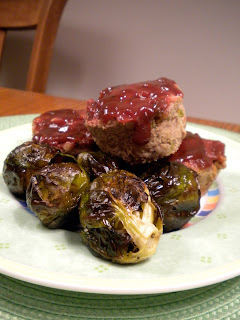 But, in the spirit of cutting carbs, I paired the meatloaf with some roasted brussels sprouts. OK, wipe that disgusted look off your face. Brussels sprouts are delicious if you treat them with respect! Toss them in olive oil, salt and pepper and roast them in the oven at 400 degrees for 35 minutes. The outsides will brown and crisp up nicely. You won’t be sorry you gave them a chance.